Many have purchased a Peco turntable for its style and authenticity. Motorising the turntable can be a challenge. There have been many methods described in the past using many motorising kits. Each kit has its problems of speed, fluent movement, noise, fixing slack in components, torsion, twist and level. The kit must be well built. It is critical that the pan or base be level at the joints and the walls near vertical. The deck bridge is a strong truss that can easily support the model weights of locomotives. The deck bridge must be square when constructed. Get this wrong and the rest is beyond difficult. Fortunately the Club’s kit builder was experienced and produced it well within tolerances for squareness (within 2mm). Motorising the turntable required understanding where all the loads are bearing and how to centre loads reducing twist and torsion. Treat it as a real engineering structure. A model is just a scaled down version. The pan wall is weak and cannot support loads without deforming. The pan must be supported underneath, at least along each third of the pan. Do not load the pan walls in any fashion. We used the table frame cross-member (slotted out) and an additional flat timber bearer liquid nailed underneath the base board (see photo below). The inaccuracy in the timber straightness was alleviated by strips (track width) of woodlands under track foam glued with PVA to the cross supports. The pan sat just above the level of the baseboard. The deck bridge comes with a plastic washer or bush to mount on top of the pan. Do not lose this as the load is then transferred to the deck bridge running wheels that do not have the accuracy or strength to move without deflection resulting in the wheels binding and derailing off the pan guide rail. Lubricate this bush with silicone. This is available through music stores and is used for brass instrument valve lubrication. Around the pan wall we used Slaters brick sheets wiped with white/grey acrylic paint for grout fill and the brick faces were dry brushed with black simulating soot and white simulating lime scale effects. The Slater’s sheet did not allow a complete ring of unbroken brick. At the joints the brick was cut along the rows to simulate a crack in a brick retaining wall. The thickness of the Slater’s sheet meant the bridge ends required to be filed down the thickness of 2 brick sheets to maintain clearance between the bridge edge and brick pan walls. The next step was to lay the approach tracks to the turntable at the required angles. The rails would normally be supported by the pan wall lip. This is an unacceptable situation because the weight of a locomotive deforms the pan making it ovoid causing binding of the bridge against the pan wall. This problem was resolved by marking and installing a small brass screw under each rail to support wheel loads. The height was adjusted by screwing in or out. The height of the rail was checked to that of bridge and the screws adjusted accordingly. Please note the bridge was installed with the weight of the motor. Sleepers were removed from the track and the rails were soldered to the screw face. The screws were countersunk type to allow a flat surface to solder the rails. The crucial factor is the motor. Selected were a metal motor and gearbox operating at 2 rpm or slower and ‘whisper’ quiet. The motor is in line directly mounted to the centre of the turntable bridge. There are no torsional forces other than rotation. Refer to the photo below. The kit is supplied by Locomotech. The kit code is TTMKA (for ‘OO’ gauge). The kit can be obtained from Rupert Harper through the internet locomotech@binternet.com..
and 1.5 mm Allen Key (not shown) for the grub screws. The spindle is machined accurately and is the exact size of the hole in the turntable bridge. It is a slight interference fit. The spindle is glued into the turntable bridge using a cynoacrylic adhesive (Zap green medium speed setting superglue). The weight of the motor is all the weight necessary for the bridge to sit on the pan washer firmly. No added weights are necessary. The motor is held in place by the motor coupling sleeve. The sleeve is for two different diameters, one for the bridge spindle and the other for the motor shaft. Grub screws anchor the sleeve to the shaft and spindle. No other support is necessary. The brass bracket is purely to restrain the motor itself turning, ensuring all torque is transmitted to the motor shaft. The brass bracket is screwed to the motor with washers/ spacers. The plastic torque arm locators are glued (Cynoacrylic) to the turntable pan (refer photo above). We have located one of the locators onto the join to distribute the torque to all 3 pan segments. The join also acts as a suitable locating lug. All the motor installation was done before the rails were soldered in place. Again I stress let the pan float on the supports with no load on the pan walls and you will have a beautifully smooth operating turntable. Control of the turntable is through a Clipper 2 amp controller. This particular controller has a variable resister knob with forward and reverse. The advantage this particular controller is it has additional resister switches that allows the motor to be turned at a ‘crawl pace’ simulating actual prototypical speeds. This slow speed is enough to accurately position the bridge with the arrival and departure tracks without much effort. 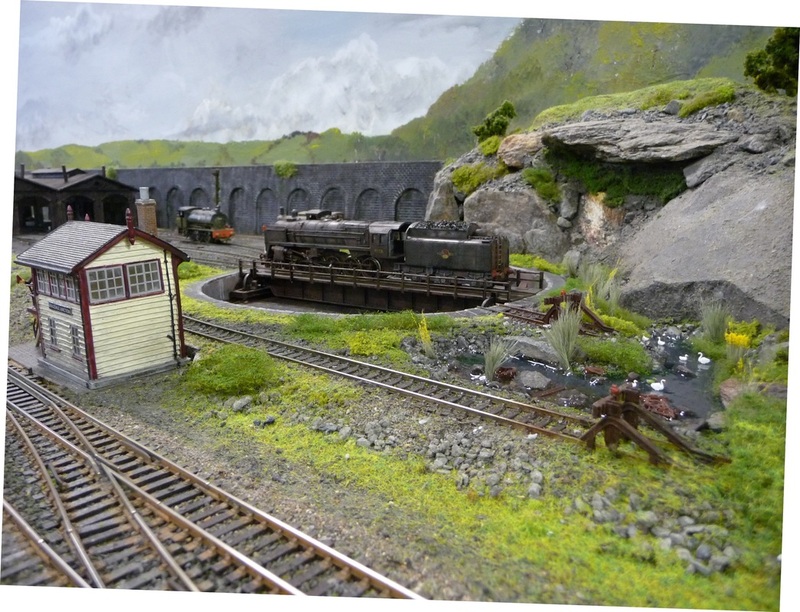 The only disadvantage is the height of our layout means short people (like Steve our master modeller of Albion) will need a stool so he can see over the turntable to line up the rails. We are working on the stool at present. The simple Clipper controller is all that is necessary to accurately position the deck bridge. 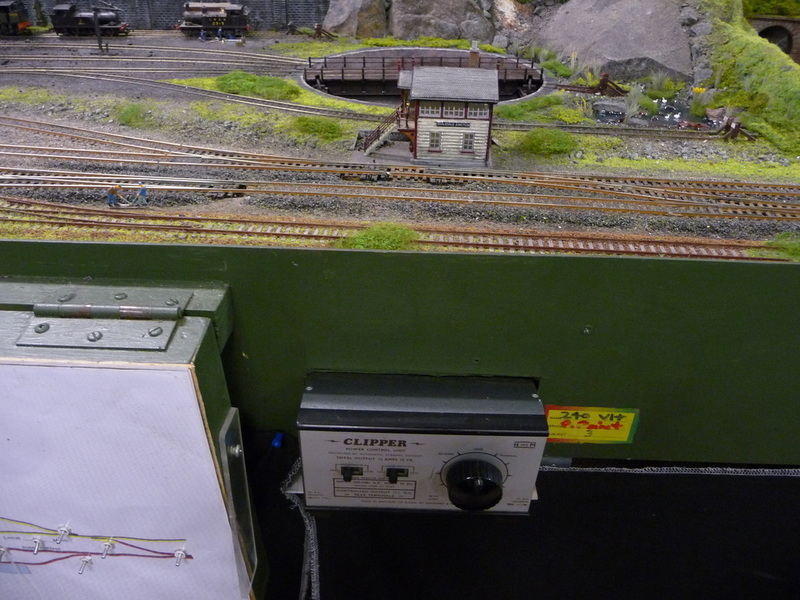 The Clipper controller is mounted on the skirting board of our layout ‘in line’ with our turntable (Refer photo below). The controller is mounted to the layout frame using aluminium brackets and timber bearers. The controller is mounted at waist height (chest height for some) allowing an ergonomic position for arm and elbow. 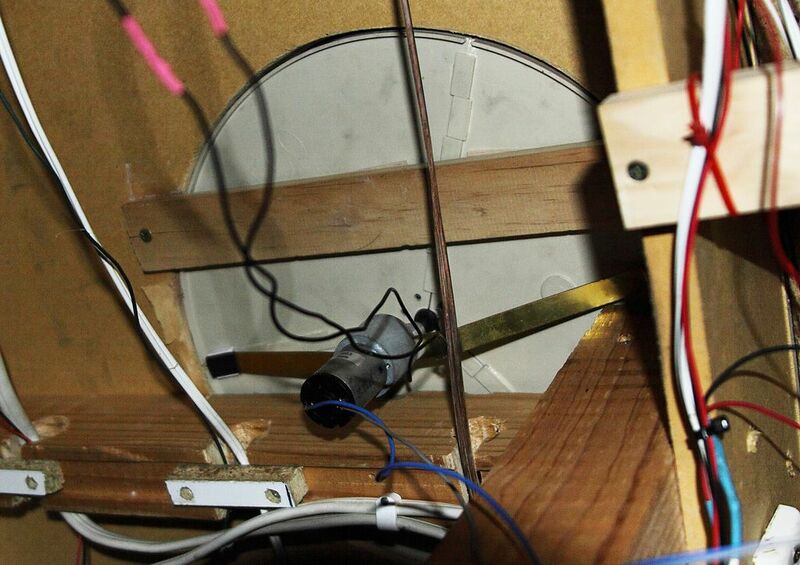 The turntable motor has positive and negative 12V feeds and this is directly wired to the controller. The bridge track feed positive and negative wires are connected through an isolating switch to the layout power supply. 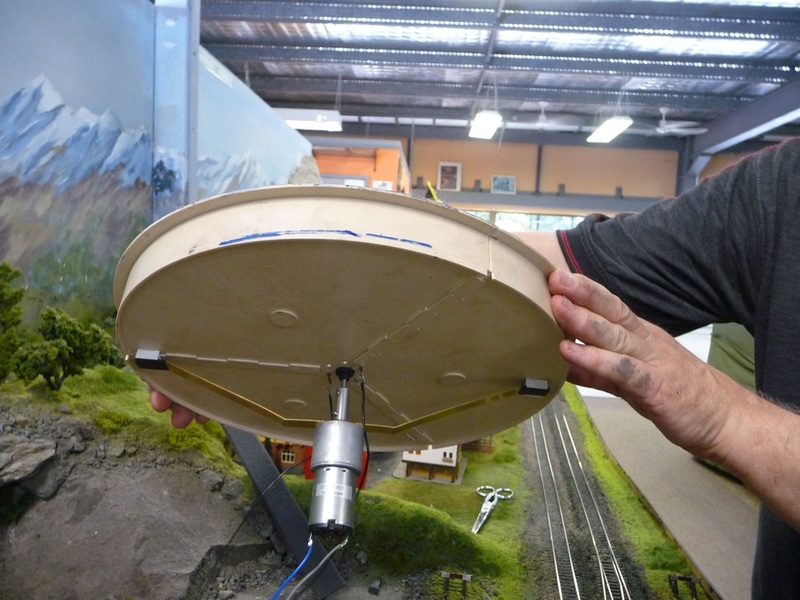 Locomotech are planning to release a control system to make the turntable positioning ‘fool proof’. We are awaiting the design and will probably retrofit it when it becomes available. The scenic component of the turntable was completed by Steve. The turntable wall top was covered using Metcalf ‘stick on’ pavers (glued with PVA). The pavers were dirtied with black shoot and a white line was painted on the edge. The turntable was set in place using grey pebbles and crusher dust (from the car park) carefully selected for size and shape and strained using a tea strainer. It is important to note that around the turntable lip a Slaters plasticard lip was positioned and glued to prevent and crusher dust and pebbles from entering under the turntable wall top. Should this happen the turntable would not be floating and this will cause the deck bridge to bind when turning. The scenic material was set in place using diluted PVA glue. 50% water to 50% glue. When we set the scenic material in place the first time, the glue seeped under the turntable wall top and prevented the turntable to float. The deck bridge instantly bound, in places, on the pan wall when turning. We had to break the bond with hammer and wooden drift. Steve was called away to lunch for this distressing activity. Fortunately not a lot of the scenic material was disturbed. A suggestion based on experience is to set the scenic material with PVA glue no closer than 35mm (1.5 inches) from the turntable lip. Use hairspray to set the material close to the turntable. While this does not give the most desirable fixing result, it is enough to prevent the dust from being picked up by the locomotives. The scenic material pebbles and crusher dust was given a light coat of soot and cigar ash to darken the surface. Weathering powder was dry brushed to give the correct ground texture and colour appearance. 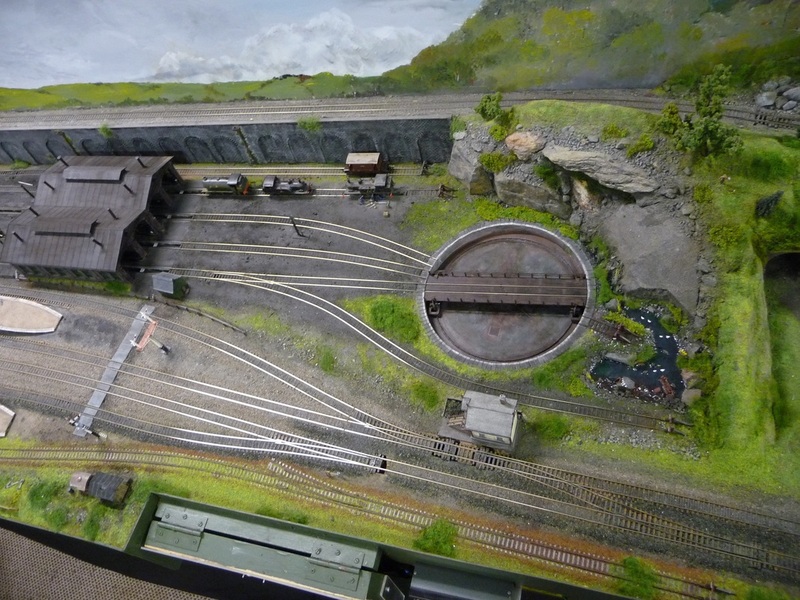 A retention water basin was modelled beside the turntable. The basin base was painted with dark blue, green and brown paints to give the effect of water depth and algae slime. Rusty 40 gallon drums, rail and a car chassis was set into the basin. Nothing ever is perfectly clean. Bushes were made using Woodland Scenic Poly-fibre (green) and green ground cover fine turf was used to coat the poly-fibre. Hairspray was used to coat the poly-fibre to attach the fine turf. Reeds were made using green coloured horse hair with Woodland Flowers in Fall Colours covering some of the tips. Grass effect used Heki short Static Grass set with a static charge generating tool. The PVA glue used for the grass was diluted 40% PVA to 60% water. The retention basin water effect used was Woodland Scenic Realistic Water. The basin was sealed well with PVA and paint. Two coats each ¼ inch or 6mm thick were poured to simulate depth. Below is a photo of the final result.